Autodesk has changed several dialog boxes to the palette. The popular example is the Layer Manager. The palette gives several benefits over a dialog box. You can change the values on the fly without clicking OK or Apply. You don’t need to close it to continue working on AutoCAD. It allows you to dock and minimize or hide it. However, hiding the palette sometimes can be annoying. When your mouse pointer gets too close to the Palette, it can accidentally open and takes some time to hide. If you like to keep your Palette open and hide it, you can change the auto-hide speed. Increase the roll-up time to prevent the Palette accidentally open. And set the roll-out time to make the Palette hide immediately after you move the pointer from the Palette. You can do this easily by installing free app Palette Auto-Hide Speed from JTB World. After you installed it, you can run it by typing JTBWPALETTEAUTOHIDESPEED in the Command Line or from Add-ins tab. Well, aren’t you glad that AutoCAD has AutoComplete feature now? Change the value in the dialog box. 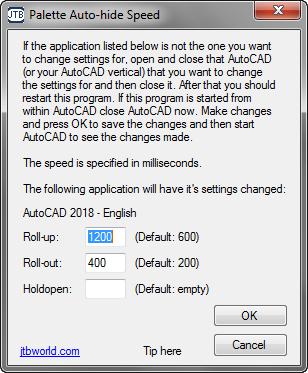 Close AutoCAD then click OK on the dialog box. Open the AutoCAD again to see the effect. Now you can work conveniently with the Palettes are hiding and docked! AutoCAD Palettes have some benefits over dialog boxes. For example, you don’t have to close it after you use it. You can leave it open and hide it. However, it can be frustrating because the Palette often accidentally open when the pointer gets close to it. The free app can help you to control the auto-hide speed of your Palettes. If you like using Palette, then you should try it. 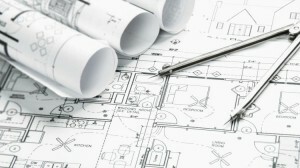 Autodesk App Store offers many add-ons that can give your AutoCAD steroids. You might want to spend some time to find useful tools there! I always forget that many people loves to use UI instead of the Command Line!